Geeks: How much you got hanging? Discussion in 'The Lounge' started by TN, Jul 17, 2008. How many gigs do you have on you right now. Winner gets a fistful of flowers. I have 8 gigs hanging around my neck. 2GB. Linux doesn't require mass tonnage. 100 gigs of music on the laptop. I carry a 1gb flash drive on my key chain. I normally also carry my 30gb Zune with me as well. 4gig PNY usb and 4gig Ipod nano. I have a 6Gb Prince Albert. Bonus points for the mini-swiss army knife! Don't forget your 12g suppository. A 6 gigaBIT? That's small! Poor you. I used to rock those too. 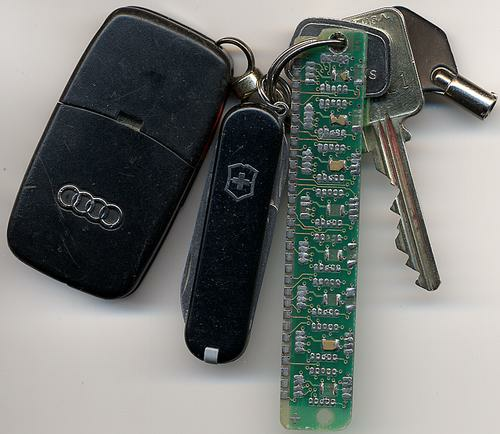 I think I have a $300 keychain back in the day. Good for opening boxes too. funny you should say that! I just opened up a few boxes with it this morning. You should see what Westy can do with his 6 gigs. Nice, Audi. You must do well?